jemangelaville.com is a Portland, Oregon food blog that first began publishing food content online in 2005 and it is run by Michelle Abendschan. If you would like me to review your product or cookbook and I feel it is a good fit for my blog and audience, I would love to do so. Related to that, I’m also ALWAYS interested in trying/documenting (and photographing) my meals at local restaurants. On that topic, whenever I get food/products for free, I will disclose that in my post. Sending me free products or inviting me to fancy restaurant meals will not guarantee a positive review. But if I have any issues with the product/meal, I will definitely let you know that before I post anything. I am also especially interested in working with local Oregon food and drink companies and restaurants. I love this region and all of the amazing food we grow/make/sell. My name is Michelle, this is my blog and I’m located in scenic (and still weird) Portland, Oregon. I like to cook, eat and take photos of it all. I live in inner SE Portland with my husband jwa. We lost our two cats over the last couple of years: Spencer who was 18 in 2011 and Chelsea, who almost made it 21 years old in February 2013. I’m sure this blog will still sometimes be about “occasionally, cats”, but we’ll probably take a little break in cat ownership to heal our hearts and fix our hardwood floors. Update: Welcome Gamera. Previously, I grew up in Chicago, went to grad school in Indiana, moved to Flagstaff, AZ to work on my thesis, moved to Menlo Park, CA and worked at an Internet company way back in the day (Infoseek, 1998-2001), then moved to Portland. A note on restaurant reviews and recipes posted here — I like all the recipes and restaurants that I post about. I don’t write about recipes that didn’t work for me or restaurants that I didn’t like. So, if you see it here, I liked it when I ate it. All of the photos on this site are my own. Please do not use them without permission. Thank you! I don’t share or do anything with the email address you supply when you leave a comment. If it’s a giveaway, I’ll use your email to contact you if you’re the winner. That’s about it. July 14th, 2005 | Category: Misc. I’m really glad to know you enjoy my blog, as I certainly enjoy Sub Rosa! I was thrilled when I saw that you had your TJ stuffed Flank steak on the website… I have a question though…. I need to cook this for 7 people… Do you know the measurements of the spinach, feta and red bell pepper? I would greatly appreciate any help you can give… Bon Appetit! Hmmmm…I bought the flanks steaks at Trader Joes already stuffed, so I didn’t really need to deal with that issue. If I were to hazard a guess, I would think maybe a bag of spinach and 2-3 bell peppers. Oh and feta….hmmm…just grab a container or two. I think once you’re assembling it, you can get a feel for exactly how much of each to use. And there’s always uses for leftover spinach, feta and bell pepper. Just make a spinach salad the next day with any leftovers! I really enjoy your blog. Reading it is the bright spot in my day. We recently moved from the West Coast to Danbury, CT for a two year stay. I miss the restaurants in SF and Wildwood and Mother’s Bistro in Portland. 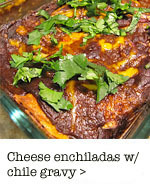 Reading your blog and trying the recipes really helps with the homesickness for CA and OR. I just wanted to tell you how much I enjoy your blog. I stumbled across it a few months ago and have been coming back regularly ever since. You remind me a little of my sister-in-law in tone (this is a good thing!) and every entry you post gets me excited about cooking. Thanks for sharing your ideas and recipes! Celeste: Thank you too! That makes me very happy to hear! Cooking should be fun! I am looking at Marmoleum also and want to find out what the best price per sq foot or sq yard that you found. I live in the hinterlands of Oregon and will travel to Portland area if the price is right. The estimate-getting part of the process has been put off a week or so. I’ll be doing that next weekend or the following. Time just got away from us. The two places we are looking at are Marions(on Grand) (about $30/sq yard) and Linoleum City (on mlk). I think linoleum city may be a bit cheaper ($3-4.00 less per square yard) but Marion’s seems easier to work with, installation-wise. I will update once I get an official estimate and get further in the process!! Just wanted to tell you that my husband and I enjoy your blog. Thanks! Anyway, keep posting! I’ll definitely be back to check for updates! I just found your blog and just love it. I can’t wait to try several of the recipes. It figures you’re lucky enough to live in Portland. My sis lives there (I think in the same area too) and I love visiting her for the food alone! We went to Caprial’s last time and hope to branch out even more over the labor day weekend. I need to get me some blog. I mean, I have one, but mostly it’s for venting about baby poo, breast feeding and inlaws (not necessarily in that order) — nothing you’d impress a future employer with. I have just spent the past two hours going ga-ga over your recipes. What a wonderful website! I love the step-by-step pictures as well as the uniqueness of your recipes. My grocery list is now two miles long in anticipation of making many, many of your delicious-looking recipes. Thank you! Just wanted to say i found your site stumbling through google images and i make sure to check up on it everyday! I’ve rifled all the way through and am crazy excited to try out some of these recipes! also love the house. its very warm and cute cute cute. I think i too just might start a blog cause yours keeps so me entertained! Keep on it, it’s tres fun! Hope the recipes ttreat you well. You shoould totally start a blog! It’s very fun. You’re right! blogging is very fun! I started one 2 days ago and i got very carried away already. It’s a phase ;). Thought i’de let you know i posted a link and mini review of your blog. Hope that’s ok with you. Thanks again for the recipes! Im going to attempt your pumpkin goat cheese dip at my grandmothers party this weekend! I’ll let you know how it goes!!!!!!!!!!!!!! I stumbled upon your blog while searching for a maple/beer marinade- thanks for your stout-braised maple-marinated steaks. They look delicious and I can’t wait to try them. (Actually, I was trying to make sure that a marinade I’ve developed is original, so that it’s eligible for an upcoming cooking contest; so far, so good). I hear Portland is Beervana. My husband brews his own, but we’re always on the lookout for delicious stuff we can buy (and with which we can cook). We are big fans of Rogue and I was delighted to see it featured in your recipe. (Incidentally my marinade includes their chocolate oatmeal stout). I plan to visit your blog again for more ideas- I am heartened by the fact that we are both inspired by AB, and that we have approximately the same grasp of the French language. My theory is that I only need to remember enough to translate menus with reasonable accuracy when travelling abroad. I discovered your charming, delightful and mouth watering blog last night while trying to locate a decent restaurant in the Seaside, OR area. (One that would accomodate two adults and two foodie 10 and 12 year old boys, who would be glued to the Food Network 24/7 if I would allow it…) Anyway, loved the review of the Pacific Way Cafe and Bakery and plan to try it in a couple of weeks. What a goldmine I found with all of the amazing recipes, beautiful illustrations and witty reparte. Thanks so much for all you write and share. I’ve been in the Vancouver, WA area since late 2003 and am still exploring the fabulous cuisine of this area of the world. Thank you for your wonderful blog. Can’t wait to explore your recipes. Hope your boyfriend realizes that a treasure he has in you! I just received my corrct copy of 125 Meatless Main Dishes cookbook today. I see a lot of good recipes which I can’t wait to try. Which recipes have you already tried and is good? First, thank you! Then, hmmm…I just read about a “cook book of the month” type class at Bar Pastiche on Hawthorne. See here for more info on that. In Good Taste in the NW has cooking classes and also, PCC (Portland Community Vollege) has a number of cooking classes each quarter. Thank you , I shall contact him. If any other cooking classes or rest. thatoffer cooking classes come to mind please post. Good Taste is $100 & up, Pastaworks is much more feasible. And Thank you for the welcome. 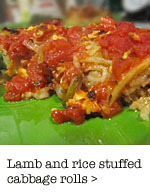 Stumbled across your blog and I just wanted to say “thank you” for all the great recipes! Nice inspiration for me….. I enjoy your site almost every day and appreciate the accessibility of it – you make good food, weekend trips, and everyday stories very palatable!! The superfood blueberry bars, by the way, are excellent and almost all gone! Thanks. Hey michelle- i am just coming across your site for the first time, i was looking for a recipe for macaroni and cheese that dave lieberman made on an episode all about mac and cheese, i had accessed it before from foodtv.com, but misplaced it, i have not been able to find it and emailed food network, they have gotten back to me twice, saying there was no such episode or recipe, so i did my own search and came across your site, love what you did with the mexican macaroni and cheese recipe, exactly the recipe i was looking for, and will check out your blog regularly now, do you have the other recipes from that episode, and have you made any changes? I tried to email you a response but my message bounced. So, here’s my response: sure. I would just ask that you credit me for the images and let me know which ones you use and where they are going (ie: coursework for where?). I was looking for pork tenderloin recipes and magically I found right here (what for me is almost impossible) moist, tender, sauced up and servable pork perfect recipes and photos. Thank you so much for sharing your talents, such gifts, with strangers. I just found your website and am already enchanted. Can’t wait to try out a few of the pretty-looking recipes. I’m in the middle of moving, but once I get settled again, perhaps I’ll start a sister (brother? wicked stepsister? adopted sibling?) site – Cooking Well on a Grad Student’s Budget or something like that. Thanks again – keep cooking! I found your blog just like this, by “surfing” on the internet. It was a very nice discovery. I admire you for doing all this pictures and posting so regularly. I’m studying English in Paris( Sorbonne), but am Polish. I don’t like cooking, but since I’ve seen your blog it’s changed. Really!!! I do not cook often, but still, sometimes my boyfriend is surprized when he comes back home and sees a table full of delicious food. He teaches English. We both love languages. I think that you are a very friendly person. If you have time, we could sometimes chat on the phone( I can call US for free). It would be nice to have a nice friend. With my studies, I’m busy, I do not have a lot of friends. I’m often home. Good luck with your lovely ‘cuisine’. Ah, yeah, I wanted to tell you what we had on dinner tonight: oysters with some lemon juice on the top, then we ate some shrimps marinated in ‘creme fraiche’, soya sauce, pepper and garlic. We did not eat a lot because it’s hot over here now. Take good care, and I’m very happy that you’re going to get married. Love is the most beautiful thing on Earth. Thanks a lot for sharing your blog and your passion about food and cooking. I am not at all a “bloggy” but I enjoy yours. It is part of my “favorites” now…. I love this site. My mother who lives in Portland sent me the link and since then, i have eyed your recipes with wonder and drooly appeal. I especially love how you have shot your food and step-by-step approach to the recipes. How do you make the food look so good on camera? I wanted to tell you about an event SubRosa is doing for the organization I work for, Growing Gardens — on June 13th, Mary Ann is donating 50 percent of the proceeds to our work to ensure healthy eating for everyone. Growing Gardens achieves this by planting organic vegetable gardens in the backyards of low-income families and individuals, and supports them for three years with workshops, mentors, seeds and starts. On the off chance that this might be of interest to you to either attend or promote on your fabulous blog (I read it daily! ), I thought I would send it your way. I have a PDF press release with some more information, if you’d like. Hey Michelle, I stumbled across your blog by googling “marmoleum kitchen pictures” and now I’m hooked. We just bought an old bungalow in NE PDX and after a rather exhaustive search (compulsive behavior on my part) purchased Marmoleum Click at….Linoleum City. I actually thought their price quote was a mistake, since it was so much lower than everyone else’s. We ordered Sahara planks and Barbados tiles, my husband designed/will install a modified checkerboard pattern. My question to you is, how did you go about painting your cabinets? How much work did it take? Would you do it again? I have 3 different cabinet refacers coming to give estimates this week but we’re trying to keep costs down…..I’d love to hear your comments. If you’ve already blogged this info, sorry! Just tell me to keep searching. Thanks for all your recipes/insights/comments on life in this amazing city. Just found your blog I am a chef for the oldest farm in America Tuttle’s Red Barn in Dover N.H. Always looking for a twist on recipes and of course adding my own. Hope I can use some of your likes in our kitchen. You know I should have a blog too!My daughter has one and that’s how i found you in a round about way. We both follow Angry chicken and you are listed as one of her favorites.Well got to go,just letting you know someone out their is reading. Welcome and thanks! 🙂 You should have your own blog…! I just found your blog googling for a recipe for Trader Joe’s frozen albacore steaks. I’m going to try your marinade from the March 07 post, and the accompanying salad looks yummy too! I’m in Minnesota (noticed your U of M reference), so preparing tuna that isn’t canned and that fits into my budget is a bit of a challenge- Trader Joe’s is my best shot. Thank you for the recipe! It’s been a pleasure perusing your blog- your writing, recipes, photos, and watercolors- all beautiful! I enjoyed poking around your blog…very fun. I am writing to inform you about Share Our Strength’s Great American Bake Sale, a national campaign that mobilizes Americans to help end childhood hunger by having a bake sale in their community. Now in its’ fourth year, over 1 million people have participated in the campaign to aid the 12 million children in America who are at risk of hunger. The campaign, which runs through August, was recently promoted by celebrity chef Rachael Ray on ABC. Share Our Strength’s Great American Bake Sale offers a unique way for you to connect with your readers about the severity of childhood hunger in America while providing them with a simple and fun way of how they can fight it. Perhaps you can include information about the campaign in a section of this blog? I was unable to find an email in which to contact you. Please feel free to contact me if you have any questions, and I can provide you more information about the campaign. Love your blog, love your blog so much I wrote an ode to it on mine! Keep up the spectacular blog and phenomenal photos. Hope you’re having a great day! Do you have any advice on getting into the Portland Food scene? Just moved back to hometown with useless and/or useful east coast art degree. ps. love the blog. love tiramisu!! http://www.portlandfood.org is a message board and a GREAT resource on the portland food scene. They have regular get-togethers and generally seem like a nice bunch of people. You should check it out and jump right in to the conversations! ps: which I need to do too — but I am lazy, shy and busy. A really bad, bad combination! I writing to you from London,UK a long way from Portland and The USA but I must say that your blog has been a great reference for new and inspiring recipes over the last year. About a month ago I invited some friends and family for dinner and made the ‘Madadamia Nut crusted Halibut’ with the mango/asian sauce and I got some very impressed ooohs and aaahhs throughout the meal and I joined in too because it was amazing! Thanks a million. Its unfortunate that I didn’t know of your blog when I visited the US west coast in 2001 because I would have loved to visit the type of restaurants you write about. Theres nothing like getting recommendations from locals, moreover, when they have similiar interest in good food. Its a good excuse to plan another trip! I may just have to do my own blog related to London restaurants and my own recipe ideas. I’ll keep you posted. I want to thank you for posting a beautiful picture of our restaurant in Port Townsend, Wa..Lanza’s ristorante. You pictures are spectacular. Hope you enjoyed yourself in POrt townsend. In short, we did have a wonderful time at Lanza’s! I stumbled across your fantastique blog when I googled Camas and gelato. Although you don’t appear to deal with those two things put together, I am enjoying reading all your posts. We live in Vancouver, and enjoy the great food of PDX and the NW in general. Now if only I could find a stuffed spinach pizza to compare to Giordano’s, I’d have it made. When we were in Ireland, we watched a show called The F Word with Gordon Ramsey. Great food show! Your blog makes me so happy. Thanks so much for sharing. I somehow accidentally came across your blog while doing some research for my job. You’ve made me hungry, and I am now ready to gnaw my arm off! Watch out vending machine, here I come! Great blog! Thanks for sharing. Hi Michelle. I just found your blog (via my mom and your edamame dip recipe) and I wanted to know if you have an email address at which I can contact you? You can respond directly to my email submitted here. Thanks! I grew up in Portland and, due to some family issues (some good, some not so) have had to return frequently lately. I now live in the SF Bay Area and cook frequently for my wife and two young children. I was searching for a pork sauce and yours was exactly what I needed (a version I’d seen in Cook’s Illustrated, or perhaps just a coincidence). My grandmother passed away in March of last year and left two houses on 24th and Hawthorne my two brothers and I just sold, so I know the area well. I’d been coming there for Thanksgiving and Christmas Eve ever since I could remember, and now with my gram, dad, and aunt (who’d also lived in the HAND area from the 50s until her death in ’99) all gone, the area still holds powerful memories for me. Thanks for the recipe and power on! Michelle, your blog is such a delight! I found you via Google when I was trying to pin down what constitutes a Nicoise dish. The other sites I went to gave me a headache. Your site is a breath of fresh air! The way you write keeps me laughing, when I’m not struck dumb by your wonderful recipes. I don’t cook, actually, but I’m about to forward your blog to my culinary sisters, who will surely relish it. Thanks for sharing your life. I’ve never been to Oregon, but I may have to visit now, if only to experience those delightful restaurants you write about. Congratulations on your engagement! I just love your blog but have been away from it for a while. I shouldn’t view it on an empty stomache! My dear friend in Houston will be directed to your blog and I’m sure she will be as impressed as I am. Thank you for the wonderful and beautifully presented recipes and travelogues. I ran across your blog tonight. I am so jealous that you are getting married at the Hotel Elliot. It is my favorite place to stay in Astoria. I live in Vancouver Wa. I lived in SW Portland before. I do love reading about places I have been to through someone else’s eyes. Good luck on your wedding. Many happy days are coming your way! I cannot believe I came across your blog. I left portland (graduate of Grant High!) for a job in New Mexico. I really miss Portland, and the food! I am going to pass this on to all of my school mates across the US who may not know it exsists. Thanks a bundle! Yeah, we really like that hotel too. And we’re getting pretty excited. Now, as long as it doesn’t rain! I was looking for inspiration on a salade nicoise and voila there you were. What a beautiful blog. I’ve seen lots of recipes I’m looking forward to trying. Congratulations on your beautiful wedding..i know about the almost crying thing…our funny thing that happened was my mother’s dachsund decided to roll over on her back behind us during the ceremony. It most definitely relieved the tension! Your website is a master class work of CULINARY ART!! Every recipe is a masterpiece! Your attention to detail, variety, creativity, inventiveness, and mouthwatering pictures is unmatched. I have been around many recipe websites and yours is 5 gold Michelin stars . I hope your in the process of writing a book, or even starring on the cooking channel or opening your own restaraunt. Your awesome! With your website I will have a couple years of new foods to create for friends and family. Many gracious thank you’s for the effort you put into this one of a kind website!! I’m so looking forward to trying all your ideas. We at the Review just found your blog a little while ago and we’re really impressed! We’ve added a link on our blogroll. You know how you end up looking someone up and it goes on and on? Well I graduated high school in Yankton, SD – Dave Gannon was one of my friends so that is how I found your blog. I didn’t realize you lived right up the road until I started really reading it. Then on top of that you are a Flickr member – fantastic! While reading your blog yesterday I had an aha moment. I work in an Assisted Living. After 10 years of back and forths we put in our own garden and the residents have their own tomato plants, corn, cucumbers, chilies etc. The produce cannot come through our main kitchen because of rules and regs. It can be prepared through a smaller kitchen in our activity room. My moment was this – after reading your blog about Farmer’s Markets – lets have a once a month sit down, special dinner for our residents. Only 20 reservations will be accepted first come first serve. We will be serving local produce, breads, cheeses and wines. Each manager will be responsible for their table of four residents and will be in charge of also decorating it. If your have any suggestions…please give them to me. i stumbled onto your blog whilst googling chimichurri recipes. sorry to be such a luddite, but how do i subscribe to your blog? the recipes are fantastic, but your narrative sealed the deal. I’ve made several recipes per your recommendation, and they all turned out great! I am not a blogger, but decided to say hello…. Thanks for keeping your blog going, it is a source of inspiration for many, I am sure! Nice! Was looking for a recipe that used ginger and pineapple..so, here in New Zealand we’ll try it tonight but am gonna simmer the salsa with a little apple cider vinegar and blend the sucker. Great site name and lovely, easy, refreshing design. ps I didnt read all the blog entries – hows the job? I stumbled across your blog because I am in the middle of wedding planning, and my coming wedding (in October) seems to be very similar to your ceremony. We’re also going to be staying in the Presidential Suite at the Hotel Elliott with our ceremony on the roof deck and are looking into catering from Bridgewater Bistro. Your blog has really been inspiring me during the planning process and I would love to ask you a few more questions about your experience – I would be so grateful if you would contact me so I can pick your brain a little bit. Thank you so much and congrats on the wedding! Hello – just found your blog yesterday, because I was searching for a carrot salad recipe. I made the “actually tasty carrot salad” and it was a huge hit at my group dinner last night! I’ll return frequently from now on. All the best from Spokane, Wash.
Hello. I stumbled across your blog while doing a search for weddings at the Hotel Elliott. I’m getting married there on July 11th. Your wedding pictures are amazing. We’re getting married on the roof but having a dessert/champagne reception in the Presidential Suite. Let me know if you have any words of wisdom. Hi. I stumbled on your blog looking for a Vietnamese salad roll recipe. I really enjoy it and the recipes look great. I am deeply a foodie. I attended Western Culinary Institute in Portland and lived there a couple glorious years. Also my bro lives near 38th % Washington in the Hawthorne district so I have at least a wonderful week every summer being Je Mange la Ville, to use your wording. Last year we ate at this little place that served glorious That (Vietnamese?) street food — some of the most succulent Asian food I’ve ever eaten. Anyway, when I googled the name of your blog it said “Address not found.” How can I get to your blog without searching for salad roll recipes? I came across your blog looking for a good pork tenderloin recipe. i just tried the pork tenderloin with apple cider jus…holy cow. SO GOOD! i looked through your other pages and i REALLY like your blog!! i fwd it to my mom who is also quite the foodie. i am planning a trip to oregon this summer so am looking fwd to trying some resto suggestions!!! I just found your blog and have been drooling over your posts for about 20 minutes now! I don’t know what I want to make first, my head might explode. Can’t wait to leave some comments on tried recipes. Thanks for sharing. 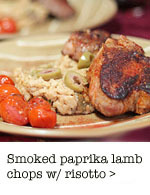 I stumbled across you “google-ing” for a grilled lamb chop marinade. Your blog is gorgeous. I want to try every recipe. My chops are swimming in your lovely marinade right now. Thank you. I have a zuchinni overload! I am greatly pleased beautiful photos, I am anxious to continue and discover more.Thank you et bonne journee!! I stumbled upon your blog a couple months ago when I was looking for a French Apple Cake recipe. I had a French exchange student staying with me and was trying to convert her recipe from metrics and centigrade into ozs and cups and farenheit…anyway I saw your recipe for French Apple Cake, and made it. The results were awesome! In fact I just made it again. I have looked at maybe one year’s worth of recipes, and want to make just about everything you write about. I love your commentary, photos, and food sensibility…you speak my language girl! I also made the Asian Spicy Noodle dish with basil….and the noodles with peanut sauce….both very successful. I haven’t come across so many recipes that ring my chimes for a long time…thanks and hats off to you! I had to crack up when you say you turned 37, and were freaking out….oh dear…I am 57! Love the blog. I’ve been reading and saving recipes for awhile, and have turned that mole-rubbed pork into a monthly occurence (often pairing it with some kind of home made smokey salsa or bbq sauce). 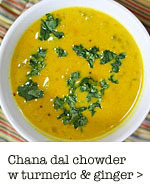 Making your curry carrot soup recipe tonight for a soup party. Now I just need to figure out a beer to pair with it (leaning hoppy and bitter just to test out curry + IPA). Keep up the awesomeness, your blog is one of the first places I look for inspiration about food to prepare. Love your site and blog, keep up the great work! I wanted to take a moment to say thank you for a really wonderful blog. I am so impressed with all the great reviews, recipes and overall great writing. I happen to work at Accanto and really appreciate your most recent review. I am glad you had a wonderful brunch. Say hi to me at the bar next time you have brunch. 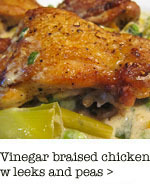 ps- I would love to get a link to our http://www.accantopdx.com website from jemangeville!!! A Portland friend of mine sent me your url, and I love your blog. The photos are wonderful, too. I’ll be in Pdx in July, teaching at In Good Taste, which is home away from home when it comes to teaching. I will also be pushing a new book. Is there a chance you’d be willing to make a mention of both in your blog? I’d be happy to link to you from my own site, and get you a book. I’ve got a couple things going – one is my school and life site, http://www.onruetatin.com; another is the book blog http://www.nutsinthekitchen.com Those two will do for now. There is more, but don’t want to overwhelm. Thanks again. I’d love to meet when I’m in Portland. what about sellwood? any great ideas for girl’s night out – not too expensive – fun and yummy? I cant even tell you how much I am going to stalk your blog! I have lived in Portland for 25 years and moved away 7 years ago to a small sad epicurion example of taste bud bliss in the farthest northwest part of Washington. I fell upon your blog while searching for a recipe and was curious about your name and its inclusion of “PDX”. Portland and the surrounding area is what i consider home. You are a walking, talking, lens snapping, lip smacking, mouth watering journal of what I miss! It is like you crawled up in my head as we see things similarly. Thank you~ God I miss the restaurants! So weird! I started a food blog about a week ago and just found out about yours today while Googling Portland, OR food blogs. I swear I hadn’t seen yours until today but you would swear I am a major copycat. Another crazy coincidence? I live in the Hawthorne area, too! I had to say hi and introduce myself. Love your blog – can’t wait to try so many recipes! I LOVE your blog! I lived in pdx from 1983 to 2004 and now reside in Bellingham, WA. Anyway your French Apple Cake looks heavenly as does everything so far that I have seen. Thank you, thank you for this little slice of foody heaven! I was on Google searching for Pain de Mie and found your Blog. So far in my 72 years I have been able to NOT start reading Blogs but now you have me hooked, what a great resource for want-to-be cooks like me. I belong to a 6 member Dinner club and my plate for our next dinner is Wild Mushrooms on Croutons and the recipe calls for Pain de Mie and I cannot find a bakery here in Portland that bakes that. So my question to you is do you know where I can buy a couple of loves? Thank you for a wonderful place to visit and learn. I absolutely love your website and I have bookmarked it. I tried the puffed pastry cinnamon rolls and they were fabulous. They turned out perfect. I am particularly interested in your baking section on bread as I am going to start learning that. Thanks, you are an inspiration! Glad to see someone as passionate about cooking as I am. Your pictures are great. Look good enough to eat. Look forward to trying some of the recipes. Thanks!! Hi Michelle, great blog ! Always great too meet somebody who does really care about cooking and still keep a realxed attitude towards it. Awesome photos, too. How do you manage preparing a meal and taking pics at the same time?